We saw several people bailing on the ride. Mustache on yer Bike - This one's for you Joe! Individually hand-crafted by metalsmith Laura Crawford, the Bike Mustache is a whimsical adornment for bicycles around the world. Every bike has personality, but does yours have enough personality to sport a 'stache? 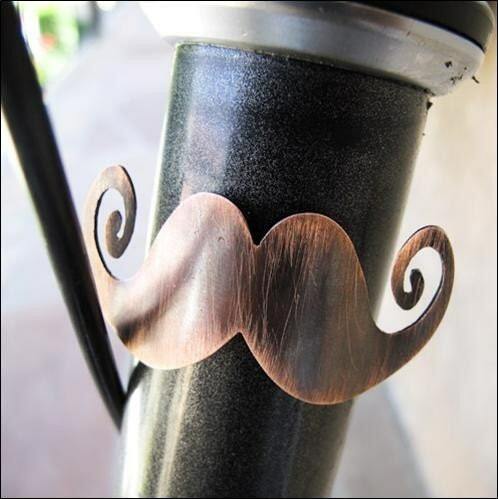 Give your bike a bit of bling and help it to stand out from the crowd with a copper mustache head badge. Approximately 1" tall by 2" wide. Keep it flush against the frame, or bend the curls out for even more fun. Attach to your bike with an epoxy (such as JB Weld) or a heavy-duty double-stick tape (such as 3M). Please note: Because each mustache is pierced out by hand, there may be a few very minor differences between the one you receive and the one pictured. If you're interested in a sterling silver mustache, just send me a convo and I'll create a custom listing for you. Only $55. Electric car marker Tesla went public on June 29 with great fanfare. At $17 per share, the IPO was priced above its expected range and more shares than expected were sold to meet high demand. Tesla was the first American car company to go public since Ford in 1956 and one of the best VC-backed IPOs in recent memory; the stock jumped 41% on its opening day of trading. As a result, Tesla was hailed as a reminder of the promise of American ingenuity and (further) proof that capitalism is far from dead, despite myriad reports to the contrary. 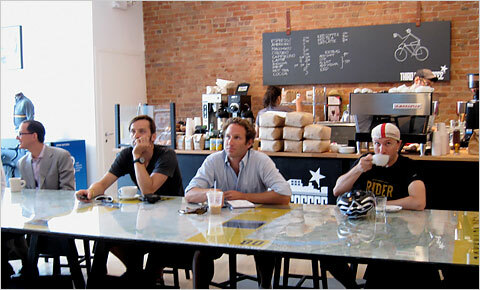 At the Rapha Cycle Club you can enjoy coffee and the Tour de France. Rapha Cycle Club, a pop-up bike shop that opened in NoHo, offers three important amenities: two flat-screen televisions that will show all stages of theTour de France live (then played on a loop until the next stage), indoor bike parking and a full-service coffee bar from Third Rail Coffee. A young designer has invented a revolutionary folding bicycle that will stop thieves in their tracks. 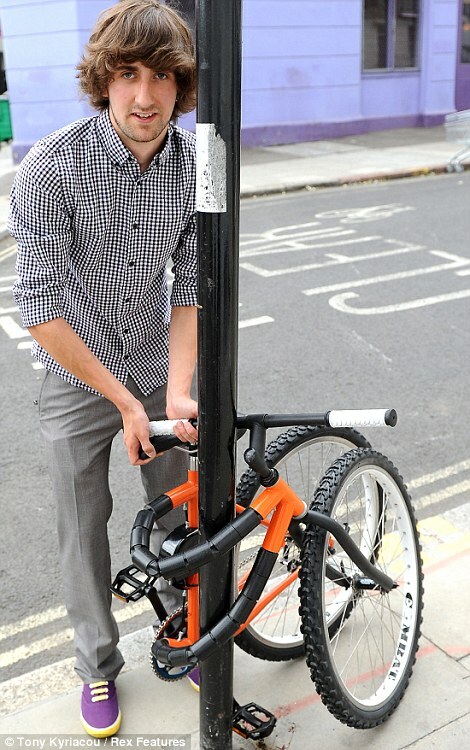 Kevin Scott, 21, designed the space-age bike that wraps around a lamp post so it can be locked-up safely - without the need for a lock or chain. The De Montfort University graduate used a ratchet system built into the frame of the bike to allow it to wrap around a pole, enabling the lock to be wrapped through both wheels and the frame. ODOT has received stimulus funding to implement rumble stripes on 1650 miles of Ohio state routes. The reason for this is to improve motorist safety. Unfortunately, rumble stripes are hazardous and very annoying for cyclists. I am trying to be open minded about this because they improve safety for motorists, and because ODOT is considering cyclists in the design. They are planning to use rumble stripes (on the lane stripe) rather than rumble strips (1′ to the right of the stripe) and to install 10′ gaps every 50′. The long term plan is for all state routes to have rumble stripes if they are outside urban areas, have shoulder > 2′ and speed limit > 45 mph. If the road is a bike route, the shoulder must be > 3′. I am disappointed that there will be long stretches of SR 104 (the TOSRV route) being striped, just in time for the 50th anniversary tour. I have ridden on rumble strips on 104 north of Chillicothe, 23 north of South Bloomfield and SR 50 east of McArthur, and they all stink. OBF has been expressing our concerns with ODOT folks. We did ask at the last Ohio advocacy meeting that the new stripes be installed at various locations around Ohio so we can ride them and see what they are like. Currently, there are only rumble strips in Ohio. If you want to comment on the ODOT plans, please contact scott.varner AT dot.state.oh.us. 8 to start. One dropped off at the start to play polo. We added another along the way. This year's ride will be on Saturday, July 17th. Registration is from 7:00 a.m. to 10:00 a.m. at the Licking County Family YMCA. The tour will be a fully hosted tour with well defined routes, rest stops, plenty of food vendors along the route, SAG and, of course, cookies! We've designed this year's tour to appeal to family riders, casual road riders and the long-distance hill-climber looking for a challenge. Route options of 32, 64 and 100 miles wind through the scenic back roads of Licking and Knox counties. After your tour enjoy a fun filled day at the YMCA outdoor pool. Refreshments will be on-hand throughout the day. 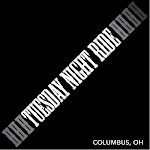 This full service tour will guide cyclists through some of the most beautiful trails and back roads in Ohio. The 32 mile route features paved bike paths and country roads that are level to rolling with a few short hills that will take you throughout the communities and landmarks of Licking County, Ohio. The 64 & 100 mile routes present the same beauty with just a few more significant hills. Proceeds from the tour will support maintenance and preservation of the trail systems located in Licking County. Using the wheel in the fight is classy. Much better than carrying a knife. Editors note: I met members of the Rock Hill Bicycle Club at an REI while traveling. Very friendly people looking for riders of all levels to ride with them. So, if you are ever in the Rock Hill, SC area check them out. Located in the Old English Section of South Carolina, the Rock Hill Bicycle Club (RHBC) represents a collection of recreational riders, racers and mountain bikers. As of 2005, the club has been in existence for over 25 years, with a membership of more than 100 riders. Known for its growing sports market, York County is one of the fastest growing regions in the United States, just minutes south of Charlotte, NC. While many RHBC members reside in York County many others hail from neighboring Lancaster and Chester Counties as well as North Carolina cyclists from Mecklenburg, Gaston and Union Counties. The RHBC is a not for profit organization whose purpose is to promote the personal enjoyment of bicycling by its members and the cycling public. One of the oldest bike clubs in the Carolinas, the organization promotes fitness, friendship, safety, maintenance and competency in cycling. The club is actively involved in arranging bike tours, scheduling rides and races, encouraging bicycle commuting and sponsoring bicycle events. The RHBC serves as a voice for the community by promoting cycling education to the general public. The RHBC boasts the oldest continuously held bicycle race in South Carolina, the RHBC Spring Race, and supports area cycling by sponsoring a monthly ride calendar with levels ranging from beginner to expert. We also host a variety of races throughout the year such as sprints, criteriums, road races and time trials. We encourage you to take a look around our site! Please let us know if you have any questions or suggestions regarding our clubs efforts!